Just copy and paste your unique interview invite in your favorite ATS or CRM template and you’re set. We’re excited to make it even easier for busy recruiters and interview teams to schedule phone interviews. This week’s release includes a simple way to schedule phone interviews. 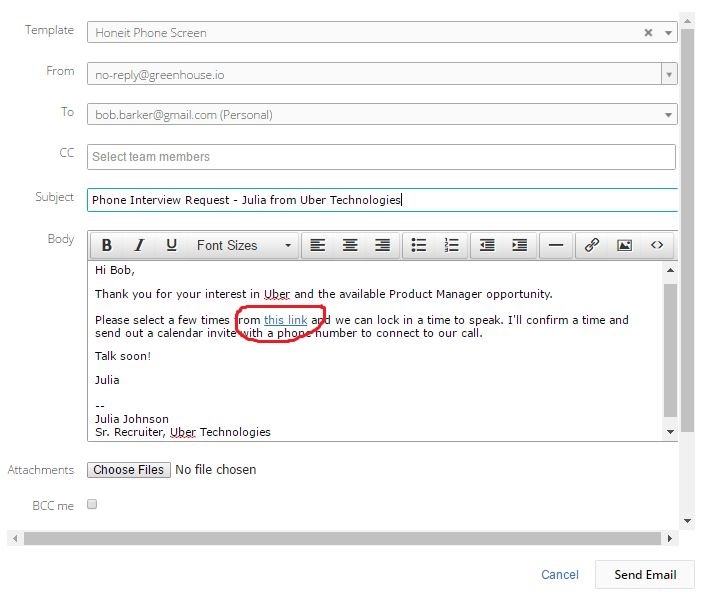 Just include the interview invite link in your ATS or CRM email template, to find a convenient time to speak. Example: https://honeit.honeit.com/it/nlivingston – Feel free to ‘book us’ today for quick phone conversation through the system and a live demo, to experience how easy this is on candidates! No integration or set up required. You can also include these links in your email signature, or share them with candidates on LinkedIn, Instant Message or standard email response. Candidates see a branded landing page with your logo and colors, and pick a few times based on the Recruiter’s schedule & interview availability. Once the candidate selects their availability, Recruiters are notified via email and with one click, interviews are confirmed and branded calendar invites go out to both parties. Candidates call the phone number provided or click a link to join the call and speak through their computer (VoIP). After the live, two-way phone intervew, Recruiters have access to all the rich candidate data and interview insights from the conversation, to review, share or analyze. We’re excited to introduce Modern Interview Communication, to accelerate the hiring process and create a better interview experience for everyone involved.